Being a Greek expat in Australia, I have often found myself (a) succumbing to nostalgia (often taking the shape of a souvlaki, the sound of an old Greek song etc.) and (b) becoming a champion for the introduction of Greek jazz and improvised music to my new friends here. Both urges were triggered by the news of Savina Yannatou coming to perform in Australia. A truly magnificent singer, with an awe-inspiring vocal ability, she has been one of the most creative artists in the Greek music scene for the past 40 years. And although she may not be a household name, even in Greece, she has gained acclaim throughout Europe, notably for her work with her ensemble, Primavera en Salonico, comprised by some of the best Greek improvisers. The band collects, dissects and reinterprets traditional songs from the broader Mediterranean region, introducing a culture of diversity to the world. 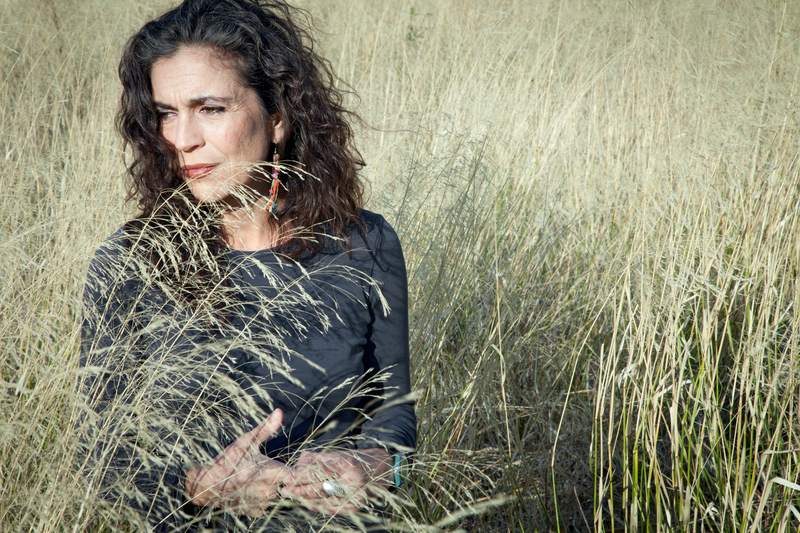 They started off with a collection of songs from the Sephardic Jewish-Spanish community of Thessaloniki, the city to which they returned with their latest album, “Songs of Thessaloniki”, released through the revered ECM records (in fact, Savina Yannatou is one of the rare vocalists on the eclectic ECM roster). I have been admiring Savina from a distance for years now, and I’m happy that I got the chance to actually interview her (for my day job), prior to her concerts in Melbourne and WOMADelaide, and ask her about her fearless forays in vocal improvisation. AustralianJazz.Net: In what way has being part of the ECM roster has affected the evolution of Primavera en Salonico? Savina Yannatou: ECM was an unexpected fortune to us. It was not something that we had anticipated. Surely, this collaboration has opened the doors of some festivals that were skeptical towards us. We became more known abroad, our albums are sold in music stores in other countries, they are reviewed in international publications. As far as our musical evolution, signing to ECM has led us to follow less traditional paths, in terms of sound and arrangements, opting for a contemporary music approach. I don’t mind that at all; the opposite would be a problem to me; I am not a traditional singer and I like to blend foreign elements with tradition. On the other hand, we have adopted the ECM ‘outlook’ in our arrangements, something that softens our playing dynamics, diminishing the free jazz side of me. In a way, it is as if our intellectual side prevails over our instincts. AJN: You have been very thorough in your exploration of the potential of the human voice, through vocal improvisation. What has been your motive? SY: My motive was to set myself free of the musical composition form, free from harmony and melody. In other words, I wanted to do whatever came to my head, even silliness; especially, silliness. I was tired of rules and discipline. This is how I found myself in the realm of free jazz, which was natural. I was a fan of Peter Kowald, whom I had seen playing in Greece, and I also admired singers such as Diamanda Galas, Tamia (Valmont) and Shainkho Namchylak. So, while playing with percussionist Nikos Touliatos, for a limited audience, I started to create my own vocabulary as an improvisor. Later on, I met with Peter Kowald again, we played as a duet for a couple of years and through him, I found myself in Wupertal, in a new world of hope an creativity, surrounded by new musicians, new musical codes, new people; German, English and French impovisors, Greek and Chinese visual artists, Pina Bausch with her goup; we were rehearsing by day, meeting at bars by night… It was a vibrant community of artists, assembled in one street in the city, with Peter in the centre. AJN: What have you discovered about yourself, through improvisation? SY: What was revealing, through free improvisation is that, when you start from zero, having no preconceptions and nothing prearranged when you’re on stage, you find yourself at the mercy of your own sound. The sound that you create, in its turn becomes the cause of a certain emotion, which creates the next sound, which creates the next emotion and so on. You’re not interpreting a musical piece, you are yourself interpreted, through your sound, through the musical piece that you randomly create at that specific time, on stage. This is a physical musical creative process that I knew nothing about, before delving into improvisation, and this is why it is precious to me and I don’t want to give it up.